Salem Grade School’s Jazz Ensemble plays a “Joyful Time”, arranged by Victor Lopez, during the Feb. 2 Band-O-Rama at Westosha Central High School. 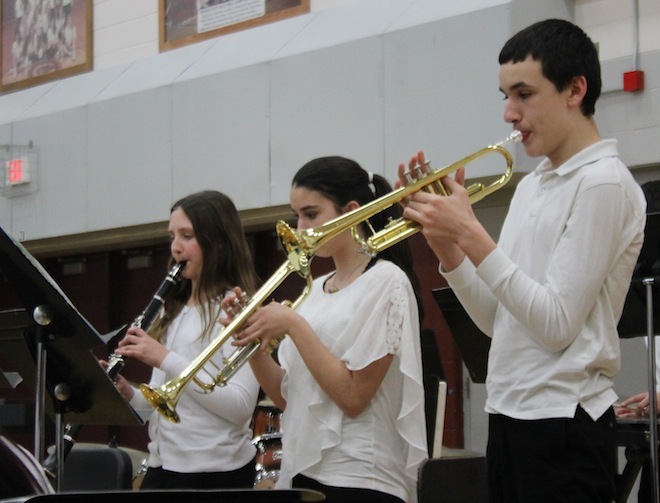 From left: Ava Phillips, Jaden Ourwerkerk and Jacob Bricco adds a trumpeted sound to the melody (Jason Arndt/The Report). When Heidi Anderson was in grade school, she remembered participating in the annual Band-O-Rama at Westosha Central High School, where feeder schools collaborate on a collection of songs. Anderson, who attended Salem Grade School, is now the band director at her alma mater and guided students at the event held Feb. 2 in the Westosha Central gymnasium. Other band directors were Ben Warmuth, Brighton/Paris; Zachary Wendt, Wheatland and John Murphy, of Bristol. Collectively, more than 400 students, including representatives from Westosha Central’s Jazz Central and Wind Ensemble, entertained the crowd of at least 1,000 people. The multi-school performance, according to Westosha Central band director Adam Scheele, has been a fixture for at least 25 years. Scheele, meanwhile, came away impressed with this year’s collective performance, especially since area schools were cancelled for three days because of weather last week. “I thought this year’s performances were pretty good, especially since we had three days off of schools, so we had a few hiccups, but for the most part, everything went smoothly and I was pretty happy with it,” he said. Songs included, but were not limited to, the “Star Spangled Banner”, “It Don’t Mean a Thing” arranged by Michael Sweeney, “Super Mario Bros” arranged by Paul Lavender, “Batman Generations” arranged by Justin Williams, and “Captain America March” arranged by Paul Murtha. Anderson, who directed her Jazz Ensemble students in a rendition of “Joyful Time”, arranged by Victor Lopez, believes students from each school performed remarkably. The annual event, according to Scheele and Anderson, brings several benefits for both students and staff. Scheele, who directed the “Star Spangled Banner” and Rob Romeyn’s “Of Heroes and Demons, among other songs, always looks forward to working with students from each feeder school. “I like the fact that I get to work with the grade school students and the grade school students get to see what it is like to play at the high school level,” Scheele said. Meanwhile, for Anderson, she noted the experience exposes students to a larger crowd. Additionally, the collaborative effort promotes teamwork, she said.